BITTANK LTD was started on 7th of June 2017 and added to AlexNews on 27th of August 2017. It's a popular program but not so many investors has joined yet. It's a big budget HYIP, at least the concept is very big. Unfortunately, it wasn't able to attract serious investors and I'm really seeking the reason behind this. To my opinion, BITTANK LTD is a very promising program and it deserve investments from serious investors. 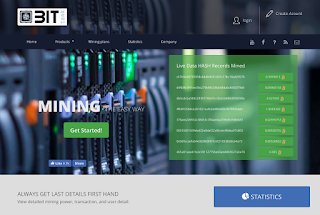 The main concept of BITTANK LTD is mining Bitcoin. The process is little complicated to make you understand but mining bit coin is a real profitable work and less riskier than forex. Although, BITTANK LTD may not offering real mining profits but they have decorated a very good website with all real components. It should look too real with a company certificate and Extended validate SSL. There are lot of peoples searching and investing in Cloud Bitcoin mining via various companies and if some of those peoples reach to BITTANK LTD then they'll definitely keep it ahead in the compare of other companies. However, the profit rates are high and that's why its a HYIP. And that's also another reason why people invest in HYIP. By the way, I've already praised about their website and it's really way different than other traditional HYIP. The menus and articles are also different as usual. On the other hand, There is no live chat support or virtual phone numbers which were necessary for this type of project. They've a YouTube channel with some video reviews but only 17 subscribers there (Ah, don't you know that you can buy subscribers easily from black hat market!) and it wasn't able to impress me. BITTANK LTD is offering 3 simple and easily understandable investment plans - 0.04% to 0.09% per hour or 0.96% to 2.16% daily for 365 days. Minimum investment is started from $5 only and the maximum is $36,000. From $5 to $349 investments will be earning 0.04% per hour means 0.96% daily. Total profit is 350% where the real profit is 250%. $350 to $1949 investments will earn 0.06% per hour or 1.44% daily for 365 days. Total profit is 525% and the real profit is 425%. $1950+ investments will earn 0.09% hourly or 2.16% daily and I the real profit is 688.4%. The total profit at the end of the term is really attractive but I think these plans are suitable for big and medium investors. Small investors may not choose this plans. I'd suggest to choose the 2nd plan (but only if you afford to lose $350+) as the real profit will be start coming from the 70th days where it will took more than 104 days in the 1st plan. BITTANK LTD accept too many payment processors to invest here which is rear to see. They even accept more payment processors than real cloud mining companies. BITTANK LTD is made of a custom script and you'll get a familiar member area here. You know, custom scripts are expensive but this member area may failed to impress you. By the way, BITTANK LTD is hosted on a OVH server who do not offer shared hosting service. So, BITTANK LTD is hosted on VPS or Dedicated server which can take load of many visitors at once. Extended Validate SSL present for secure connections and also the green bar is a beauty. Finally, I have found a connection between BITTANK LTD and matrixbit from their DNS. There is a possibility that the creator of the both programs are same. But, this is not an discredit for BITTANK LTD as the matrixbit is also a reputable program and running from more than 700 days. Whether they've connection or not, BITTANK LTD is a program from a serious admin and we can hope a long life of this program. However, BITTANK LTD is a HYIP like another HYIP programs and may stop paying any day. So, please don't invest what you can't afford to lose.